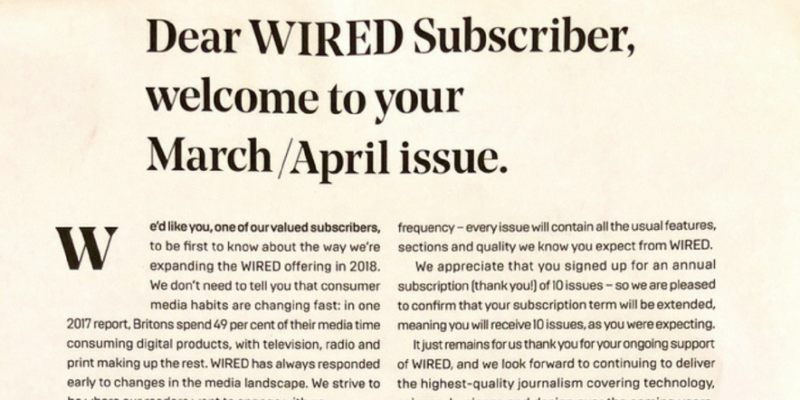 Wired UK has stopped releasing print issues on a monthly basis and will instead to go to press just six times a year, the tech magazine has announced. In a note from editor Greg Williams in the most recent issue, it was revealed that the UK mag will halve its print frequency. Rather than blaming the change on circulation or lower returns from print, the leader stated that the company will boost its investment in its digital platform where it claims to have had an 80% increase in traffic in 2017. It also directed subscribers to its social channels and Wired Awake newsletter.